We would like to invite you to attend a special concert commemorating this anniversary, Sunday March 24th, at 6:00 PM. The concert will be held at Velda Rose Methodist Church, 5540 E Main St, Mesa, and will feature 85 singers and a 25-piece orchestra. 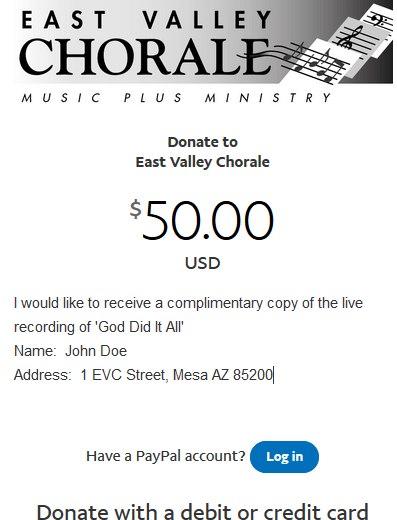 We are hoping to make a live recording of the concert; if you attend the concert, you could actually be part of our 8th CD, ‘God Did it All.’ The concert repertoire will include our most requested songs as performed during our existence, including Written in Red, My Jesus I Love Thee, Only Jesus, and How Can I Keep From Singing?, and We Are More Than Conquerors. The East Valley Chorale will be celebrating its 20th anniversary in March of 2019. When we formed the Chorale, we had 12 members from 3 churches, and now we have 80 singers from more than 50 churches. The chorale has performed hundreds of concerts for churches, RV Parks, care centers, retirement communities, and assisted living facilities. We sing from 2 to 4 times per month throughout the year. Our concert audiences have ranged from 4 to 900. If you donate $50 or more, you will be entitled to a complimentary copy of the live recording. (Be sure to include your name and address in the ‘write a note (Optional)’ field as shown below, or in the ‘memo’ portion of your check.